Back of Beyond Baking: Healthy Muf-fun! 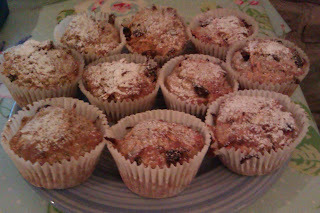 After my success with the low fat banana and blueberry muffins I started to have a look through my old muffin recipes, of which I have many. I first fell in love with baking muffins when Mr Vander-Cave and I went to America for a holiday. We were lucky enough to be invited to stay with freinds who had upped sticks and moved to Long Island. They lived at Cold Spring Harbour, which was so beautifully tranquil but just a short train journey away from the manic energy of New York City. We really were able to see the two sides of New York! We did all the tourist stops in the city including the top of the world trade centre(15 months before it was raised to the ground on one of the most terrifying days in modern history) . The flip side was seeing the surburban lives of Long Island residents; being invited to a Barmitvah party, having coffee with the Long island ladies who lunch and watching little league football. Our hostess for the week is a fellow baker and took me to her favourite local book shop, I really wanted to get some classic American cookery books so under her guidance, I bought the classic "Joy of Cooking" and several American muffin baking books. The muffin books were a revelation. No creaming ingredients, no scales needed and fabulous flavours, all produced in under 40 minutes. I was hooked. Over the years I have made many of the recipes in these books but until a few days ago had never ventured into the chapter entitled "Somewhat healthier muffins". What had I been missing all these years; big flavoursome muffins with between 170-208 calories each. The first recipe I tried from the healthier muffin chapter was carrot oat muffins. Very low fat and only 191 calories. Being a carrot cake fan I was a little dubious as to how these would taste without the cream cheese frosting, but with the sultanas, crushed pineapple, carrots and lots of warming spices I didn't miss the frosting at all. Even Master Vander-Cave was impressed (he is one of my biggest critics) and he was getting some of his 5 a day so what more could anyone want! At this point I ought to say a bit about making muffins. Before you start it is really worth investing in some measuring cups if you don't have any. I had mine as a wedding present and they are still going strong 16 years later. When mixing muffins one should use no more than 20 strokes of the spoon using a folding motion. When filling the muffin cases, fill them to three quarters full to get a good "muffin top"! If making less than 12, fill the remaining holes in the tin with water, this helps cook the muffins evenly. Makes 9 muffins, each muffin contains 191 calories and 4 grams of fat. Preheat oven to 200c and place 9 muffin cases in the muffin pan. In a large bowl stir together the flour, oats, baking powder, bicarbonate of soda, salt and the spices. In a large jug stir together pineapple, buttermilk, egg whites, oil and vanilla. Stir the brown sugar into the pineapple mixture until well blended. Make a well in the centre of the dry ingredients; add the pineapple mixture and stir to just combine. Stir in the carrot and sultanas using only a few light strokes. Spoon the batter into the prepared muffins cups. Bake for 17-19 minutes or until a cake skewer inserted into the middle of a muffin comes out clean. Remove from the oven and leave the muffins in the pan for 2 minutes then remove to a cooling rack to finish cooling. These muffins keep well for several days and freeze well for up to a month. 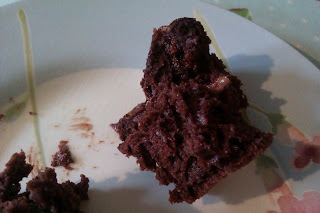 My second Healthy muffin attempt is one for all the chocoholics who want healthy chocolate muffins. Makes 12 muffins each muffin contains 197 calories and 5 grams of fat. Preheat the oven to 190c place 12 muffin cases in the muffin pan. In a large bowl stir together the flour, sugar, cocoa powder, baking powder, bicarbonate soda and salt until well combined. In a large jug stir together buttermilk, egg whites, oil and vanilla. Make a well in the centre of the dry ingredients; add the buttermilk mixture and stir to just combine. Lightly stir in the chocolate chunks. Bake for 15-20 minutes or until a cake skewer inserted into the middle of a muffin comes out clean. If you wish to be particularly saintly omit the chocolate chunks which gives a calorie count of 175 calories per muffin. Labels: Carrot oat Muffins, Double chocolate healthy muffins. Just a quick update. The chocolate muffins don't keep for much more than 3 days so if you aren't going to eat them all in that time frame, freeze them.